More Products and Images Coming Soon! 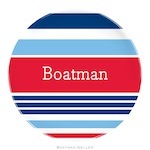 By reinventing the world of stationery using the leading trends in fashion and home décor, Boatman Geller has whole-heartedly taken on the world of fine stationery. The stationery's clean lines, colorful patterns, and delightful icons create snapshots of the good life. As founder Jane Boatman Geller explains it, I wanted to create a sense of a lifestyle—rooms draped in toile, little boys in brightly colored rugby shirts, football fans wrapped in a warm plaid blanket, girlfriends gathering for a cocktail or two. After all, her designs combine her love for the classics, while taking on a fresh approach to traditional patterns, and whimsical illustrations.